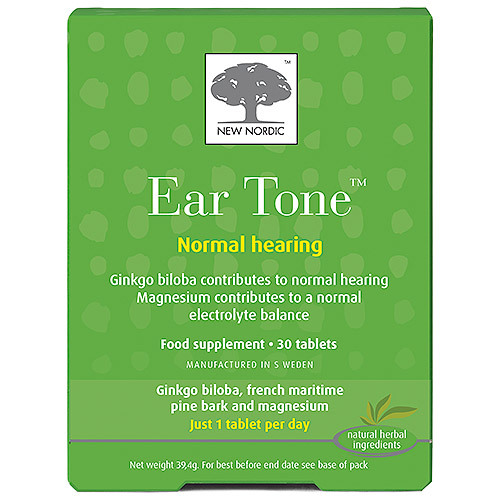 The Ear Tone formulation contains magnesium which contributes to a normal electrolyte balance. Magnesium also contributes to the reduction of tiredness and fatigue. Ginkgo biloba contributes to normal hearing. Ginkgo biloba is a unique tree without any living "relatives". The tree is a living fossil, which can be compared to fossils going back 270 million years. The Ginkgo leaves, which are used in this tablet, have been chosen, dried and extracted, so that the desired herbal substances have been preserved. Mineral (magnesium oxide), filling agent (microcrystalline cellulose), french maritime pine bark extract (Pinus pinaster, Aiton), ginkgo biloba extract (Ginkgo biloba, L.) coating agents (magnesium salts of fatty acids, hydroxypropylmethylcellose), disintegrator (cross-linked sodium carboxymethylcellulose), anti-caking agent (silicon dioxide). 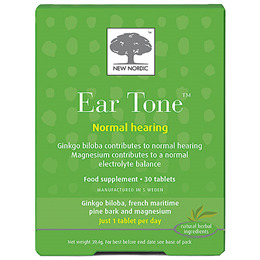 Below are reviews of New Nordic Ear Tone - 30 Tablets - Best before date is 30th June 2019 by bodykind customers. If you have tried this product we'd love to hear what you think so please leave a review.